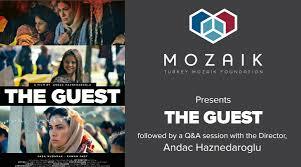 Turkey Mozaik Foundation Presents "The Guest"
Turkey Mozaik Foundation cordially invites you to the screening of the award-winning movie “The Guest”, followed by a Q&A session with Andaç Haznedaroğlu, the director, on November 19th, 2018. Seeing the obstacles that refugees have to overcome and their transformation into the heroines of their own story paves the way for the viewers to better understand the challenges that Syrian refugees must face on a daily basis and their feelings. Turkey Mozaik Foundation will donate the proceeds from the event to a charity, working with refugee children and women in Turkey, striving towards their inclusion. You can purchase the tickets for the movie at Eventbrite. If you would like to make a donation, please use our campaign page on JustGiving by clicking here. ‘The Guest’ tells the story of Lena and Meryem during their flight from the war in Syria. Lena is a ten-year-old girl who has lost her family in the war. She finds herself forced to make her way to Turkey with her baby sister and their neighbour Meryem, along with other refugees. What Lena really wants is to return home, while Meryem’s hope is to reach Europe. They arrive in Istanbul only to face new challenges, they do not know anyone and they get abandoned by the only people who could help. Lena’s efforts to survive in the big city inspires us with hope. At the end of the tough journey, they have both learned to love each other with compassion. And their journey makes us reflect on the question: What if a war were to break out tomorrow closer to home? Andaç Haznedaroğlu graduated from the Acting Program of the Anadolu University State Conservatory in 1996. Over the course of 16 years, she directed many TV series in Turkey. In January 2014, she directed her first short film, Oğul/My Son, for which she also wrote the script. During her television and cinema career over twenty years, Haznedaroğlu directed several hit TV dramas. In 2014 she founded her own production company Andaç Film Productions and made her film debut.